I took this picture of the main entrance as I left. 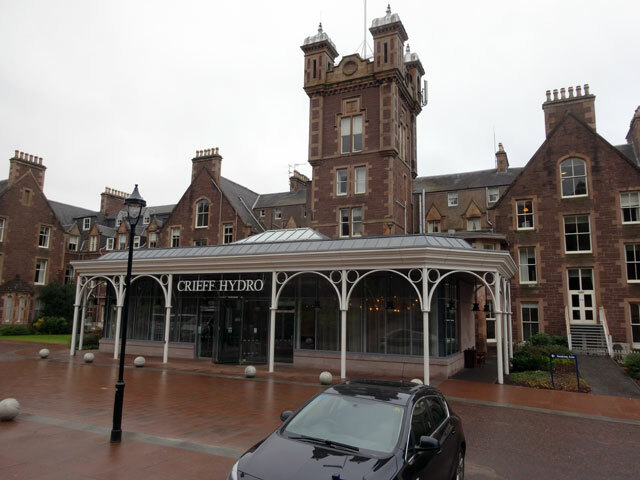 Crieff Hydro is very grand! I had intended to get up at seven but I turned over when the alarm went off and woke with a start at quarter to eight. Still I showered and was down at breakfast for eight in time to have something of everything for breakfast. It was a huge plateful of all that a modern hotel provides for its guests, and I certainly did it justice. There was time to return to my room, do such packing as was necessary, return my luggage to the car and still be in the conference suite for nine. We started with prayers (presented ably by Victoria my neighbouring clerk from Melrose and Peebles presbytery). Now we were into a session on terms and conditions for presbytery clerks – a session which highlighted the differences between clerks in different presbyteries. While the ‘top table’ had wondered if there was a case for a centralised contract with similar conditions, the clerks themselves seemed to me to be more in favour of a guideline approach. However the session was soon over and we were into another in which we were introduced to matters on the horizon – things about which to be aware as the next Assembly approaches. I found this quite interesting and it led us into coffee before a brief AGM – clerks will be back at Crieff next year for another instalment – and then a short service of Holy Communion before it was time to leave. One o’clock is a perfect time to drive home from Crieff. I was back in Mount Pleasant by three and the journey around the by-pass took only a little more than ten minutes. I had time to deal with emails and sort myself out a bit (and take Mix for a decent walk) before Rachel and I set out for Berwick to attend the Maltings Theatre where we ended up at a production of Treasure Island by the National Theatre aimed clearly at children and quite significantly rewritten. The children in the theatre clearly enjoyed it and the set was quite stupendous. On the way home we stopped for a Chinese take-away which we enjoyed at home. It was delicious.